A highly desirable oak longcase clock of good proportions and colour. The 8 day duration movement striking the hours on a bell and with a 12" square full brass dial with silvered brass chapter ring showing Roman Numerals and Arabic minutes. Also with matted centre, sunken seconds, droop mouth date aperture, blued steel hands and makers name and place of work engraved within the chapter ring. The corners with brass spandrels. The oak case with good figuring to the long trunk door and base and standing on a single plinth. The flat top hood with oak angle pillars and wooden capitals to the glazed hood door and repeated to the rear of the hood with quarter pillars. Note: William Glover was baptized in Tewkesbury on 26th June 1737. He traded in Worcester up until 1764 when he is recorded as listing an advertisement announcing his arrival in Tewkesbury. An excellent Domestic Regulator by these inventive and well known Scottish clockmakers. The substantial 8 day duration movement striking the hours on a bell and with Deadbeat Escapement and Harrison Maintaining Power. The round silvered brass dial showing both seconds and date dials. Also with matching blued steel hands and signed by the maker to the base of the dial in large capital letters. The large brass pendulum bob with regulation nut and wooden rod. The beautifully proportioned mahogany veneered case of typical drumhead design with fiddleback veneers to the trunk door flanked by reeded quarter columns and a flame mahogany veneered oval with ebony inlay surround. The base with a raised single moulding and shaped plinth. The hood with glazed concave brass bezel, plain drum shaped top and turned horizontal supports with ebony paterae. The case also with a rare Oatbeard Hygrometer feature below the main dial. Note: The Bryson family are described as eminent and inventive Clockmakers. Robert Bryson was born in 1778 and died in 1852. He was a Fellow of the Royal Society of Edinburgh and made a Sidereal Regulator for the Edinburgh Observatory. He had two sons, Alexander and Robert who succeeded him. Itâs quite possible that this clock was made by more than one Bryson as it is simply signed âBrysonâ. Alexander Bryson was a great inventor including âa new clock impelled by a combination of Gravitation and Electro Magnetismâ and âthe means of determining the presence of icebergs during fogs or darkness at sea.â This would explain the extremely rare feature of an Oatbeard Hygrometer to the case of this clock. It was most probably used for timekeeping purposes. An excellent provincial moonphase longcase clock by this well known maker. The substantial 8 day duration 5 pillar movement with shaped plates to allow for moonphase wheel and striking the hours on a bell. The 12″ arched silvered brass dial with Roman chapter ring with Arabic minutes, signed by the maker to the centre, sunken seconds ring and centre date feature with a brass pointer. The arch with the unusual feature of the phases of the moon and with profusely engraved scrolls. The dial also with blued steel hands of typical serpentine pattern. The high quality cabinet work with a solid mahogany trunk door of full length and of a good deep colour and featuring an ornate cast brass escutcheon . The base with a raised shaped panel and terminating in a double plinth. The hood featuring brass inlaid mahogany pillars surmounted with brass Corinthian capitals, a pagoda top with a blind sound fret and three brass ball finials. The hood door also with a matching cast brass escutcheon. The sides of the hood with rectangular inspection windows and quarter cut pillars. Note: The Hedge family were prolific Clockmakers in Colchester and were in business from the early 18th century until the late 19th century. Nathaniel Hedge junior took over his Fatherâs business in 1764 and produced a large number of high quality clocks and watches throughout his lifetime. This is an exceptional example. More extensive information can be found in Clock and Watchmaking in Colchester by Bernard Mason. 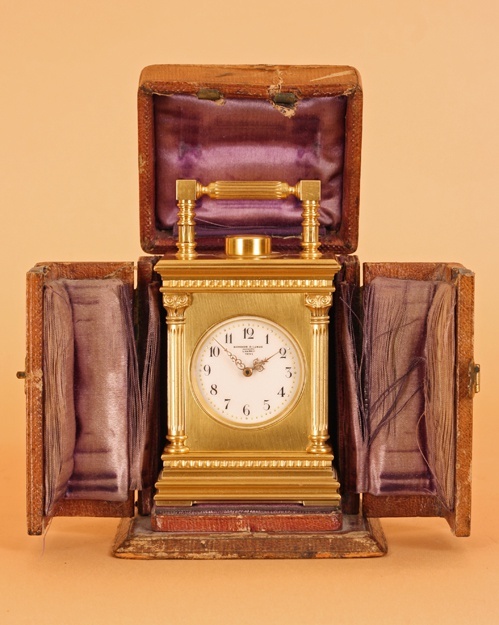 An exceptionally rare miniature Swiss carriage clock with minute repeating movement. The movement of 8 days duration with a fine Swiss lever escapement repeating by the means of a large button to the top of the case. Repeating the last hour, quarters and minutes on a bell. Access to hand adjustment, winding and regulation is gained by sliding back a brass panel to the base. The gilt brass case features fluted side columns and Corinthian capitals. The front elevation has a mask surround to the round enamel dial with Arabic numerals, beautifully made brass hands and the retailers name Barrauds & Lunds, Vendors, London, 7691. The clock is enclosed within its original leather carrying case. Note: Miniature carriage clocks or travelling clocks are rare but to find one which repeats the hours, quarters and minutes is quite exceptional. It only strikes on demand via the large button at the top, It appears to have been made in this way so that the user could reach out in the dead of night and be reminded of the time. A very unusual Domestic Regulator by these well known makers. The 8 day duration high quality movement strikes the hours on a bell and has Harrison Maintaining Power with a round silvered brass dial showing both seconds, date and makers name to the centre. Also with matching blued steel hands and finely engraved Roman chapters. The substantial pendulum bob with a double milled regulation nut and wooden rod. The unusual mahogany case of drumhead design but with a tapered trunk with excellent fiddle back veneers to both the trunk door and base. The trunk door has an unusual door lock which is positioned at the very top. Upon unlocking, the entire door is removed to gain access to the weights and pendulum. The hood has a glazed and lockable concave brass bezel and a plain round top. Note: There appear to be three possible makers of this clock listed. Alexander, David and James were all working from the same location in Princes Street in the early 19th century. Due to the lack of a Christian name we can deduce that this clock was possibly made by at least two of the Whitelaw family. David Whitelaw is described as âa very ingenious artist in this cityâ and is known to have designed a clock for the Royal Society of Edinburgh which featured an escapement that required no oil and a pendulum and ball made from marble. Our latest longcase clock is shown below. As always larger images can be viewed on our website along with an Audio file. This is an excellent example which was in a good state of preservation considering its age. Our very talented restoration team have now returned it to its former glory to be enjoyed for another 250 years. Several new items will be arriving in the next few weeks. These include two Domestic Regulators by the well known Scottish Clockmakers Bryson and Whitelaw, a Chamfer Top Bracket Clock by Tobias of London, a rare drop dial wall clock by Dutton of Fleet Street, London and a rare Quarter Striking C.1775 mahogany bracket clock by Nicolason of London. An excellent faux tortoiseshell lacquered longcase clock with well preserved Chinoiserie decoration. The 8 day duration 5 pillar movement striking the hours on a bell and with 12″ arched brass dial with separate silvered brass chapter ring, matted centre showing both seconds, date, the makers name on a silvered brass cartouche and brass spandrels to the corners. The arch with a Strike/Silent facility and typical spandrels of the period depicting sea creatures. The restored faux tortoiseshell lacquered case with gold Chinoiserie decoration to the trunk door and base depicting houses, flowers, figures and a man playing a musical instrument. The base with a double plinth and further decoration. The hood with attached angle pillars with gilt wooden capitals, glazed access door and inspection windows to the side and a broken arch top with pagoda and three gilt wood finials. Note: Joseph Herring of London is listed as working between 1767-1810 and as Liveryman of the Clockmakers Company. In 1770 Blackfriars Bridge was built across the River Thames. It was designed by the well known architect Robert Mylne. We have also been very busy developing our new website which has just gone live, its now fully optimised for Smartphones and Tablets. You can view the clocks and barometers by clicking the arrows or by swiping the screen. By clicking each product you can view larger images as before, a full description and of course the very popular audio files. You can also now purchase our clocks and barometers online using our secure integrated server. There are also two new pages discussing ‘Exporting a longcase clock’ and also a ‘Press’ page for media events and advertising features. We hope you will not only enjoy the new website, but also enjoy viewing our fine selection of antique clocks and barometers for years to come. One of our most recent longcase clocks that is new to the website and to our showrooms in Wiltshire is this very appealing mahogany longcase clock from Kingston Upon Thames. It has some unusual features and is very elegant in its design. Please click here to view the clock on the website. An unusual Mahogany longcase by this well established Clockmaking family. The 8 day duration movement striking the hours on a bell and with a 12″ square painted dial with a Roman chapter ring, Arabic minutes at each quarter and subsidiary seconds and date dials. The makers name and place of work signed to the middle of the dial. Also with matching blued steel hands of typical diamond pattern. The London style case with a long trunk door veneered with excellent figured mahogany of good colour and patina. The base also with similar veneer with an applied moulding and a shaped double plinth terminating with pads. The hood with reeded pillars and brass Doric capitals, quarter pillars to the rear and an unusual domed pediment with three blocks topped with three brass ball finials. Note: Thomas Strange is listed as working in Kingston Upon Thomas from 1791 to 1824. There appears to be 3 generations working at some point in this area for a t least 100 years or more. An Excellent Scottish Oak Longcase Clock With Strike/Silent Feature To The Arch. The 8 day duration movement striking the hours on a bell and with a 12″ arched brass dial displaying a matted centre with sunken seconds featuring two sets of initials and a date of 1767, a date aperture and blued steel hands. The arch with a silvered brass roundel showing the makers name and also incorporating a Strike/Silent facility. The plain oak case of good colour with a long trunk door, brass escutcheon and a plain base with bracket feet. The hood with oak pillars topped with brass Doric capitals, inspection windows to both sides and a swan neck top inlaid with satinwood panels, roundels to the paterea and an oval inlay just below the brass eagle finial. Note: James Mylne is listed as working in Montrose from 1740 onwards. This clock features the very rare feature of initials engraved to the centre of the seconds dial. There is also a date of 1767. This is almost certainly the date of a marriage and this clock was perhaps a wedding present. As some of you may know I was Shortlisted for a new award earlier this year which was called Antique Young Guns of the Trade run during National Antiques Week. Over 70 applications were received and I was shorlisted in the final 12. This award had been organised to celebrate the younger members of the Antiques Trade who are of course the next generation. I’m happy to report that I was awarded joint Runner Up. This was a huge surprise against some quite incredible younger members of the trade, who are in fact much younger than myself. The winner was Timothy Medhurst or Reeman Dansie Auctioneers. He joined the auctioneers at 16 years old and by the age of 17 he was auctioneering. Specialising in Coins, he now organises and runs Specialist Coin auctions three times a year. He is an inspiration and is the epitome of an antique young gun! My fellow Runner Up was Keeley Harris of Discover Vintage who runs a large number of events all over the UK including Festival of Vintage. A special Judges award was made to Alys Dobbie of Nana Dobbie who will be able to display her stock on free stand at Alfies Antique Market, London for 2 months in the Summer of 2013. Please click on the banner below to read the full report and view some images of the Awards Ceremony. Two longcase clocks, both with moonphase features to the arch but with around 100 years between them in date and of course very different in design and stature. The first is by Thomas Eastwick of London. Not a known maker as far as I can see so far but he obviously had access to the finest casemakers and from the quality of the movement he was also a very fine clockmaker. The use of a Moonphase in London is actually quite a rare feature indeed. The cabinet work displays some very fine Chinoiserie work, including seven horses in various displays and guises. At 8’9″ the case is very impressive and is perfectly proportioned in every way. A very fine example of early 18th century Clockmaking. The second clock is by Abraham of Frome. A smaller and plainer clock of course but with the added extra of a Moonphase again. Although the Moonphase feature was quite commonly used in the West Country its not usually found in an oak case. They are more often seen in mahogany cases from this area and period. Again, this longcase clock is very well proportioned and has a very good light coloured oak throughout. A very nice example. An impressive 18th century Chinoiserie/Lacquered longcase clock with rare Moonphase feature to the arch. The 8 day duration five pillar movement striking the hours on a bell and with the fifth pillar latched. The full brass dial with separate silvered brass chapter ring, engraved matted centre, blued steel hands, date aperture, the makers name engraved on an unusual basket shaped cartouche and enclosed by four brass spandrels. The arch featuring a rare early moonphase with further engraving including a finely engraved Phoenix to each Hemisphere. The actual disc with engraved silvered brass Moons and stars. The hugely impressive Chinoiserie decorated case with a green/brown ground and featuring a total of seven horses throughout the main trunk and base. Also featuring birds, lions, trees, buildings, flowers and a horse drawn carriage to the base and standing on a solid double plinth. The hood with separate brass capped pillars and quarter pillars to the rear with gilt capitals. The double domed pediment with a full caddy top with finely executed fretwork and three gilt wooden finials. Note: Moonphase longcase clocks were not very commonly made in London. This is a particularly fine example with excellent lacquer work throughout the case and an exquisite dial to match. Price: £19500.00 / Height: 8’9″ / C.
An excellent oak longcase clock with Moonphase. The 8 day duration movement striking the hours on a bell and with an arched white dial showing seconds, date, Arabic numerals, flowers to each corner and a moonphase feature to the arch. The makers name signed to the centre of the dial and with very finely made matching blued steel hands. The mainly oak case of typical West Country design with ebony and boxwood inlay and mahogany veneers to the hood. The trunk door and base flanked by canted corners with the latter standing on bracket feet. The hood with brass capped reeded pillars and a swan neck top with brass paterae and a brass eagle finial. Note: Moses Abraham was working in Cheap Street, Frome between 1810-23. He is recorded as employing three servants. He later moved to Bristol.